Even though I have read Otaku: Japan’s Database Animals twice in translation (as well as once in the original Japanese) over the past two years, I will readily admit that I’ve had a difficult time trying to understand what its author is trying to say. It turns out that the key to my understanding of Otaku was Marc Steinburg’s translation of an essay called “World and Variation: The Reproduction and Consumption of Narrative” by a Japanese pop culture ethnographer named Ōtsuka Eiji. Reading this essay was something of an extended eureka moment for me, as Azuma has clearly created his model of narrative consumption as a response to Ōtsuka’s own model. Ōtsuka’s “World and Variation,” originally published in 1989, is ostensibly about Bikkuriman Chocolates, or, more specifically, about the trading cards packaged with the chocolates. It was because of the trading cards that the chocolates were such a phenomenal hit with children around the time that Ōtsuka was writing, even though the character “Bikkuriman” had no television or manga tie-in products. The secret to Bikkuriman’s success was that, on the back of each trading card, there was a short paragraph of information about the character depicted on the front. If a child collected enough cards, he would gradually be able to piece together a larger story and gain a broader perspective on the Bikkuriman universe. Out of many small narratives, then, children were able to create a grand narrative. The point of Ōtsuka’s discussion of Bikkuriman Chocolates is that “child consumers were attracted by this grand narrative, and tried to gain further access to it through the continued purchase of chocolates.” In other words, “what is consumed first and foremost, and that which first gives these individual commodities their very value, is the grand narrative or order that they hold in partial form and as their background.” The kids who bought the Bikkuriman Chocolates didn’t care about so much about each individual card as they did about the larger story, the mythology, and the worldview – what Ōtsuka calls the “grand narrative.” Ōtsuka argues that the consumption of anime functions in much the same way. Each episode in the anime series Mobile Suit Gundam, for example, is a small narrative. The story of each individual protagonist (such as Char or Amuro) that plays out across the episodes is a small narrative as well. The diagrams and mechanical specs included in many of the toy models of the robots may also be considered small narratives. As these small narratives are accumulated, however, they begin to form the contours of an entire world. Ōtsuka argues that it is this grand narrative that makes long-running series such as Gundam (and, I would add, series such as Lord of the Rings and Harry Potter) so popular – and marketable. According to Ōtsuka’s model of narrative consumption, then, small narratives, while pleasing in and of themselves, also form pieces of a larger narrative. Ōtsuka argues that, while “the general viewing audience” will only follow one strand of small narratives, what characterizes otaku is their interest in the grand narrative. Otaku are characterized by their interest in gathering bits of information “hidden in the background,” putting these bits of information together, and creating their own small narratives based on their understanding of the grand narrative. Such a model of narrative consumption goes a long way towards explaining fan-made narrative products such as fan fiction and dōjinshi, since “if, at the end of the accumulated consumption of small narratives, consumers get their hands on the grand narrative […] they will then be able to freely produce their own small narratives with their own hands.” Therefore, otaku are otaku because they are invested in narrative consumption and reproduction at the level of the grand narrative. In Otaku: Japan’s Database Animals, Azuma Hiroki proposes a different model of narrative consumption. The Japanese title of Azuma’s cultural study, Dōbutsuka suru posutomodan: Otaku kara mita Nihon shakai, is revealing. The first word of this title refers to the concept of “animalization” proposed by Alexandre Kojève in The Roots of Postmodern Politics. This animalization involves the degradation of humans (independent subjects capable of reasoning, directed action, and compassion) into animals (mindless consumers who act on impulses such as hunger and the drive for greater comfort). It is Azuma’s thesis that otaku and, by extension, the society that has spawned them are becoming increasingly animalized. Azuma describes the narrative and cultural consciousness characteristic of otaku through what he calls the database model of narrative consumption. This database model stands in direct contrast to the model proposed by Ōtuska (which he refers to as the “tree model” in his monograph Monogatari shōhiron). To give another example of how Ōtsuka’s model interprets otaku narrative consumption, the character Ayanami Rei of Neon Genesis Evangelion, whose individual story is merely a part of the larger story, is adored by otaku because, for them, she represents the tragedy, epic scale, and political allusiveness of the entire television/film series. Ayanami Rei is not just a girl in a battle uniform, then; she is Neon Genesis Evangelion itself. To “consume” her is to emotionally insert oneself into the apocalyptic, man-versus-god atmosphere of the larger narrative. Azuma tweaks this model for understanding symbols and narrative in his database model. While Ōtsuka argues that the grand narratives of shows like Evangelion are given weight by their relevance to real-world grand narratives (such as nation and history), Azuma believes otaku narratives are almost completely removed from those of the real world. 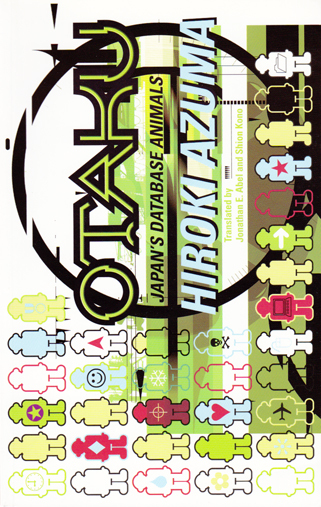 In the opening chapter of Otaku, he states, “In otaku culture ruled by narrative consumption, products have no independent value; they are judged by the quality of the database in the background.” Thus, although an otaku might be familiar with Ayanami Rei’s age and bust size, be able to quote her dialog, and expound on the quality of various plastic models made in her likeness, he is not invested any larger worldview or grand narratives that may be encompassed by Neon Genesis Evangelion. Instead, the otaku mines the series for information to plug into a mental database that also contains information on similar shows. Because of the absence of the emotional pull of grand narratives, the otaku can substitute one element of his database for another. The light blue hair of a young female character such as Hoshino Ruri from Martian Successor Nadesico or Tsukishima Ruriko from Droplet effectively is the light blue hair of Ayanami Rei. For otaku, grand narratives are nothing compared to the “animalistic” appeal of a character’s cute face or slender waist. Tropes can therefore be transferred from one story and character to another, as can an otaku’s emotional investment. Azuma claims that, “Compared with the 1980s otaku [on whom Ōtsuka bases his model], those of the 1990s generally adhered to the data and facts of the fictional worlds and were altogether unconcerned with a meaning and message that might have been communicated.” The otaku of the 1990s thus only consumed fragments, or small narratives. These fragments, which could comfortably fit within the small square boxes of a database, could then be easily cross-referenced with other fragments. Because of the ease of referencing these fragments, distinctions between an original and its copies (either through officially licensed spin-off works or fan works) disintegrated. According to Azuma, there was no longer any need to refer these fragments back to the grand narratives of either the original work or the real world. An otaku could float unanchored through the database he created through his consumption of undifferentiated narratives. And this, argues Azuma, is how the cultural phenomenon of moe was born. For otaku, stories don’t matter – it’s all about the cute girls. In the first section of Otaku, Azuma explains his model. In the second section, he provides examples of how it works. During these two sections, Azuma’s writing is clear and easy to understand. The third and final section of the book, however, is a bit of a mess. In this section, Azuma gets really excited about the internet in a manner that now seems somewhat naïve; but, in Azuma’s defense, he was writing more than ten years ago. Despite the dated feel of this last section, however, Azuma’s ideas are accessible and make a great deal of sense, even to a reader with no prior experience in postmodern philosophy. Aside from his work as a cultural anthropologist, Ōtsuka has published several light novels and collaborated on several manga projects, two of which (Kurosagi Corpse Delivery Service and MPD Psycho) are available in English. Both of them are extremely weird. Interestingly enough, Azuma is currently serializing a light novel called Fractale Reloaded (set in the same universe as the anime Fractale) in the magazine Da Vinci. He’s also involved with the official manga adaptation of the series. I suppose this makes sense, as Azuma is credited with developing the original story of the anime (along with Okada Mari, who wrote the screenplay for Anohana, among many, many other shows). For what it’s worth, I think the anime version of Fractale is amazing, and I’m really enjoying reading Azuma’s serialization of another story set in the same universe. I can only hope that someone does the English-speaking world a favor by translating it when it’s finished.